As we age, the risk of falling becomes more serious. Falls can result in a broken hip or other bones. Any injury can lead to disability. Even if someone is not hurt by a fall, the fear of falling again can limit a person’s activities. 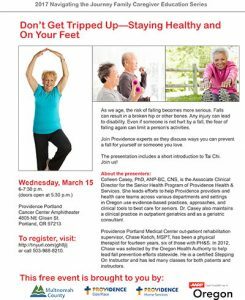 Join Providence experts as they discuss ways you can prevent a fall for yourself or someone you love.